Is your child a big fan of spy movies? Are you now on the hunt for the best spy gear for kids? Then you’ve come to the right place. Spy gear such as binoculars, night vision goggles, and walkie-talkies is excellent for encouraging active play. These are not exclusively for older children — there are plenty of options for younger aspiring spies as well. Children have an ever-developing thirst for exploring and learning new skills. It’s crucial that we continue to encourage this throughout their development. Today we’ll take a look at the best spy gear for kids. Use the links above to check the latest prices or read our in-depth kids spy gear reviews below. Children are thirsty for all the knowledge and skills they can learn. You might think there are plenty of ways for your child to practice these skills, and there are. Spy gear toys are just one way of introducing some new challenges. They spark curiosity, which in turn, leads to creative play. As your child figures out how to use and play with them, they’re developing their exploratory skills (source). Experts stress the importance for parents and caregivers to provide children with the tools they need to nurture this creativity. It’s been proven that children who have room to practice these skills do better in school, and later in life (source). Age appropriate: Depending on your kid, it’s probably best to avoid buying something meant for a different age group. These will likely be too complicated or too easy, and won’t benefit in the right ways, leading to frustration for the little ones and boredom for the older kids. For this reason, every product on our list includes the age range for which the toy is suitable. Sparks interest: It has to be fun, and something that will provide a challenge. Smaller children usually prefer something that’s easy to use and ignites their imagination, such as invisible ink pens. 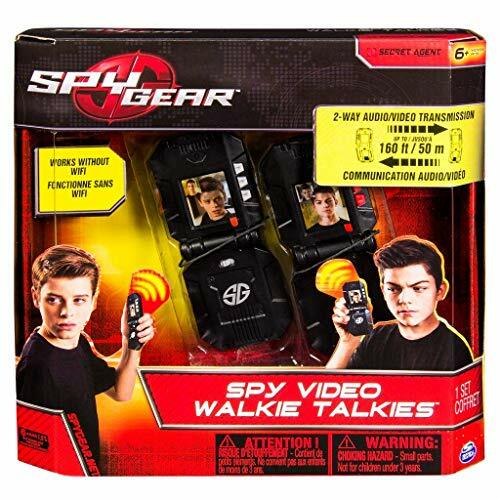 Older children may enjoy spy toys that are more realistic, such as walkie-talkies or binoculars. Night vision goggles: Great for the child who loves exploring a dark room. These are excellent for kids between four and six years old. Video walkie-talkies: These have come a long way from the regular walkie-talkies we had back in the day. Because they’re usually more high-tech, manufacturers generally recommend them for children from six years of age. 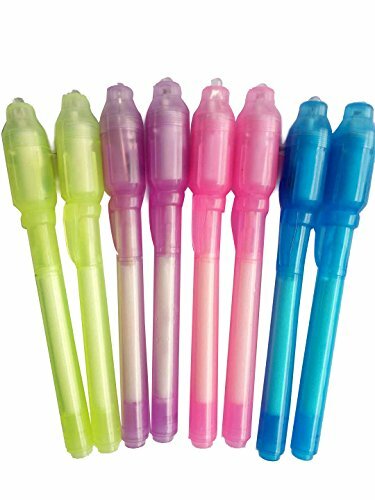 Invisible ink pens: This type of spy gear usually comes with a UV light. They’re great for all ages, but younger children should always be under adult supervision. Binoculars: These are a classic pick. Easy to use and excellent for any age, though the younger ones will probably need some help at first. Action camera: For capturing all the action, even when going on vacation. They’re usually recommended for children as young as four years old. You can also get creative with your child and try one of these spy hacks. 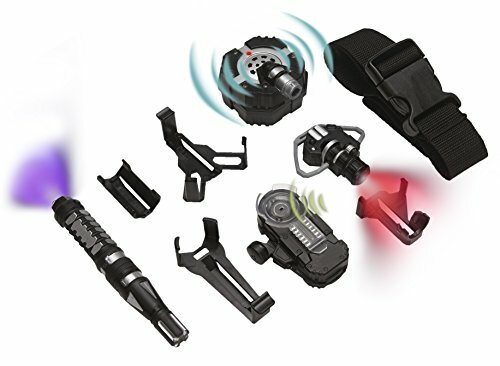 We now know some of the benefits spy gear can have, and why play is important for your kids. Whether you want a simple, single function toy or a multi-purpose kit, we’ve got you covered. 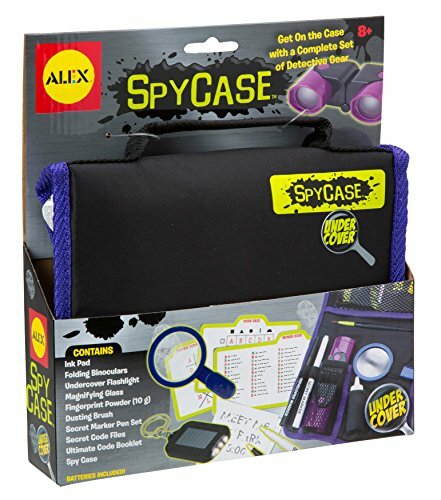 So let’s look at our top picks for some cool spy gear for kids. Spy work involves a lot of watching the target from a distance. So, to get the best view, binoculars are essential. 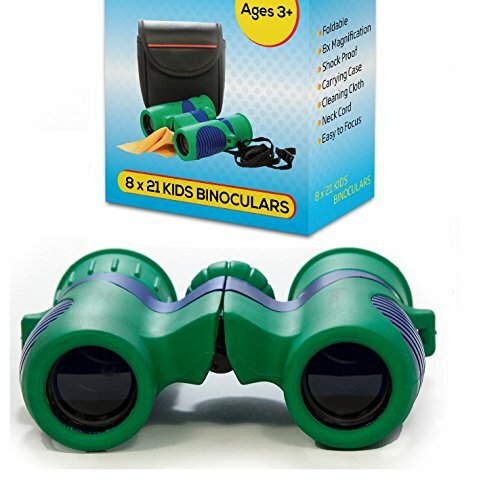 These high-resolution binoculars from Kidwinz are an excellent example. The binoculars may look rather ordinary. But you’ll appreciate that they’re shockproof and suitable for children aged 3 to 12. One reason why these are amazing for spying is the high-resolution image they produce. They’re actually fitted with a high-quality prism, which enhances the sharpness and colors. Another great plus is all the extra padding around the eye area. This makes the binoculars more comfortable for children to use. Your budding detective also receives a carry bag, a strap, cleaning cloth, and instructions. High-resolution image with 8x magnification. Rubber coating to reduce the risk of damage. Extra accessories included like a carry bag. Some moms noted that it can be a little difficult to get the binoculars to focus. Every spy needs a disguise, but unfortunately, few are made to fit junior agents — except for this costume set from Melissa & Doug. 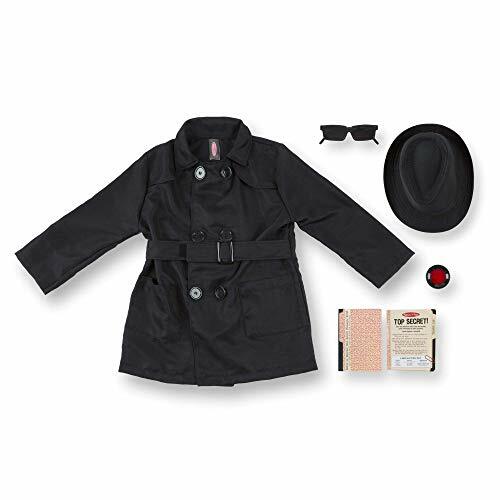 Your little sleuth will get a black coat, hat, and rearview mirrored sunglasses. The set is recommended for children aged 5 to 8. Now, there’s a mission to complete. Alongside the costume, there’s also a spy guide and tools needed to complete the tasks. Your kiddo will have to use a decoder lens to crack the secret coded card — these are all included. The fabrics are of decent quality, considering that it’s a costume. Once your child is suited up, they can begin on the spy adventure. Great spy role-play costume with a classic look. Good quality fabric and construction. Only one size — won’t fit taller children. Spies must solve the mysteries of their respective targets. Perhaps it’s about who stole the last cookie, or who left the toys out. Either way, every spy needs the necessary tools to solve a secret coded mystery. Here, your child gets everything they need. It’s suitable for spies between the ages of 8 and 12 years. In this kit, your child gets a fingerprint ink pad, fingerprint powder, brush, magnifying glass, and lifting tape. Additionally, there are also rearview mirror spy glasses and a secret marker. Also included are a codebook, two code wheels, tubes, and two decoder packets, plus instructions. Your child will have to use all the tools to crack the mystery. Lots of codes to uncover. A variety of spy gear is included. Instructions are a little complicated for some children. Any message for a secret mission has to be 100 percent hush-hush. For this, your child will need a pen with invisible ink. Maybe they want a spy-themed party for their next birthday. This example is one of the best spy gadgets for kids. It’s suitable for any child aged four and up. In this package, you’ll get a total of eight pens, each with invisible ink and a UV light (battery included). Your child can write the next secret mission on a plain piece of paper. Then when it’s time to take action, shine the UV light located on the cover to reveal it. This is perfect for imaginative play with friends, or to send secret notes to mom. Invisible ink that appears when UV light is shone on the message. With eight in a pack, these are ideal for party favors. Some reviewers mentioned that not all the pen lights worked. If your kiddo loves to experiment during a secret investigation, then read on. This scientific spy kit is everything they’ll need. It’s suitable for children aged eight years and up. 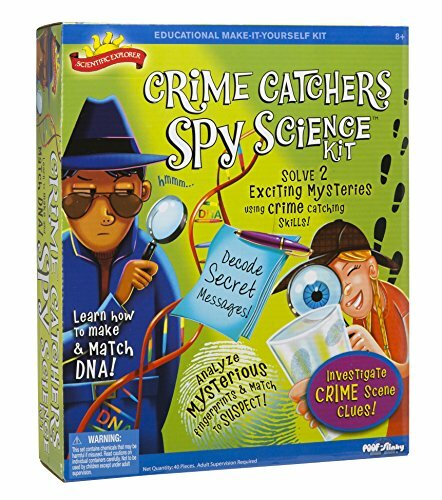 Your child will love the two mysteries they can solve, using the kit included. They solve these by completing eight fun activities. Scientific Explorer based the kit on real crime-solving techniques. So, while playing, your junior spy will get an insight into the world of “CSI.” In the set, you’ll get a few different essentials such as baking soda, citric acid, pH strips, shoe prints, and more. One great plus is that the kit provides your child with some basic knowledge and tools. Later they can expand on that by themselves. Some of the items needed are not included in the set. When on a case, a spy needs all the tracking and identification tools possible. This case set has it all. It’s recommended for spies aged 8 to 12 years. 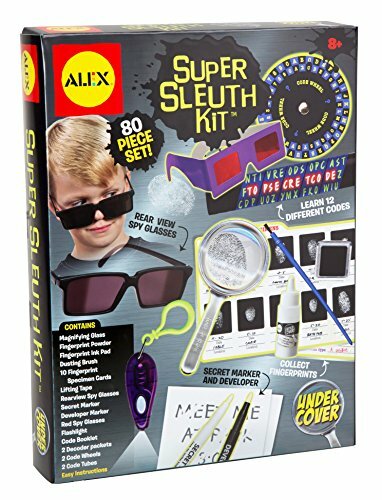 This set is similar to the Alex Toys super sleuth kit above, but here, your child gets a black nylon case to store all the tools they need. This includes binoculars, fingerprint powder and brush, magnifying glass, flashlight, and a secret marker pen. The case is sleek and any junior spy can easily carry it using either the handle or fasten it through a belt. Then, as the headquarters call for a mission, they’ll be ready to go. One reason the kids will love this case is that it encourages imaginative play, but mimics real-life scenarios. Carrying case for serious spy work. Moms mention that the case would be better with a zipper, rather than velcro. Although anyone can use all the spy gear on this list, this one is meant for girls. This ultimate spy bag is perfect for the aspiring female spy. The set is suitable for any child between the ages of 6 and 10 years. To track down the target, it’s essential to know everything about them. And what better way to do that than by analyzing their fingerprints? In this set, there’s a fingerprint kit consisting of dust powder, a brush, and an air blower. Once your spy has detected the fingerprint, they can use the dust powder as a shimmery makeup highlighter. To send the message to their fellow spies, they use the message launcher, disguised as a lipstick. Additionally, in the set, you’ll get a flashlight, magnifier, and cards for fingerprints. All disguised as makeup. Two-in-one dust powder and makeup combo. Good looking bag for stylish work. The bag’s clasp can sometimes be tricky to open. 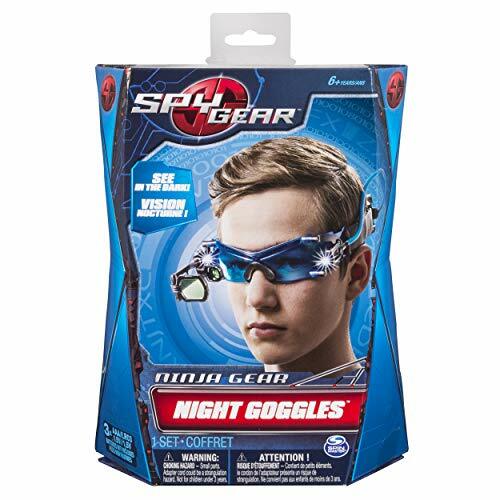 Cool spy gear for kids has to involve night vision goggles. These night goggles are an excellent navigation tool for your child. The goggles are suitable for children aged 6 to 8 years. When darkness falls, the blue tinted glass in the goggles will enhance their surroundings. For extra visibility, there are also two LED lights fitted just above the glass. As your junior agent navigates the night, they can engage the fold-out magnifying scope. This will give them a clearer view of the target from afar. To work the night goggles, you’ll need three AA batteries (not included). Great for navigating in dark rooms. Not high definition night vision. As a spy, you’ll need to be able to watch what’s going on all around you. These spy glasses are just what you need. They’re recommended for any aspiring spy aged 5 and over. They look quite normal but are, in fact, very smart. When your child wears them, they’ll quickly discover the rearview mirror effect. This allows them to see everything that’s going on behind them. 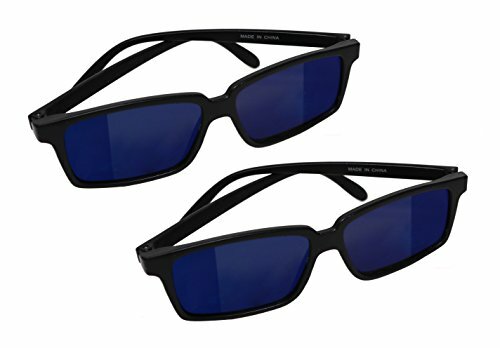 The package contains two pairs of spy glasses. They’re fantastic for creative play with a sibling or classmate. They might even fit some adults but — take it easy — don’t go breaking your kid’s super important spy glasses. 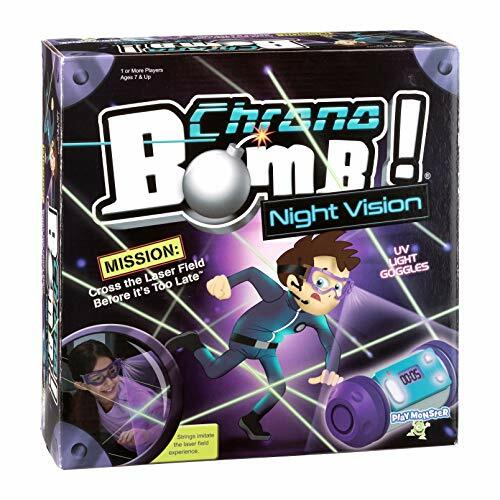 If your child needs a little help getting ideas for a spy game to play, then this product is excellent. It’s recommended for spies aged 7 to 14 years. Your child gets to create a “laser” maze (don’t worry, it’s just string). Different stands hold the lasers where your child then has to navigate. In the dark, your child can wear the UV goggles and negotiate the strings, which light up like lasers. There’s a timer, and each time a spy touches a “laser,” it counts down faster. You need to defuse the bomb before the time runs out. Along the way, there are cards with different missions to accomplish. Some parents even bought two sets and put them together to create a giant maze. UV goggles that light up the lasers in the dark. Plenty of missions for sleepover fun. “Motion” sensors are sometimes too sensitive, other times they don’t detect movement. Needs 6 x AAA batteries, which aren’t included. When becoming a junior secret agent, you’ll need all your tools to be within reach. One way to do this is by wearing a tool belt, fitted with all the gadgets a little spy needs. This set has all the cool spy gear for kids in one belt. Firstly, the belt is adjustable, so your child can wear it around the waist or across the shoulder, “Rambo” style. It’s recommended for children aged 6 to 15 years. Alongside the belt, your child gets a cool micro listener, invisible ink pen, and a micro-motion alarm. There are no night vision goggles, but a micro ear light is included. Your child can wear this on their ear and it will shine a red light over the area, for up-close detection. Requires 2 x AAA batteries. Adjustable belt for various sizes. Four working spy tools included. Fun product but could be better quality. Spies can benefit from a gadget to record any evidence to hold against their respective targets. The Kidizoom action camera can do just that. It’s suitable for any child between the ages of 4 and 9 years. 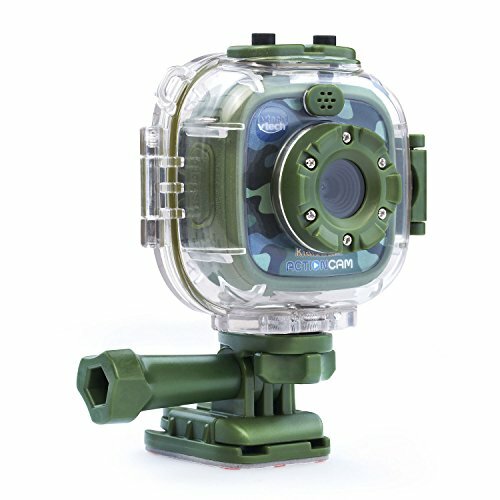 This camouflage action camera is both durable and versatile. Your junior spy can attach it to a bike, helmet or even a skateboard. Or, if the spy adventure involves a trip to a secret submarine, it can go underwater as well. The camera features a 1.4-inch color LCD. It can capture photos, with options for timelapse, video recording, and stop-motion videos. The battery is rechargeable and works continuously for up to 2.5 hours on a full charge. Waterproof case for underwater photography. Can attach to different objects such as bikes and helmets. Includes games, fun filters, frames, and photo effects. Communication is key for any spy. Keeping in touch with HQ, receiving valuable information about the target, etc. Needless to say, a walkie-talkie is a must-have. But what about a cool gadget, such as a video walkie-talkie? Naturally, it comes in a twin-pack, so a friend or sibling can join in on the fun. No Wi-Fi or data is required to communicate. The walkie-talkies simply connect using a wireless connection that reaches up to 160 feet. Your young spy can send video and audio messages between the two walkie-talkies, with an automatic shut off after 15 minutes to save power. It’s suitable for children 6 and above. Six AAA batteries are required (not included). No Wi-Fi or data required for communication. Easily fit in a pocket when folded. Letting your child pretend to be a spy is one of many ways to encourage imaginative play. 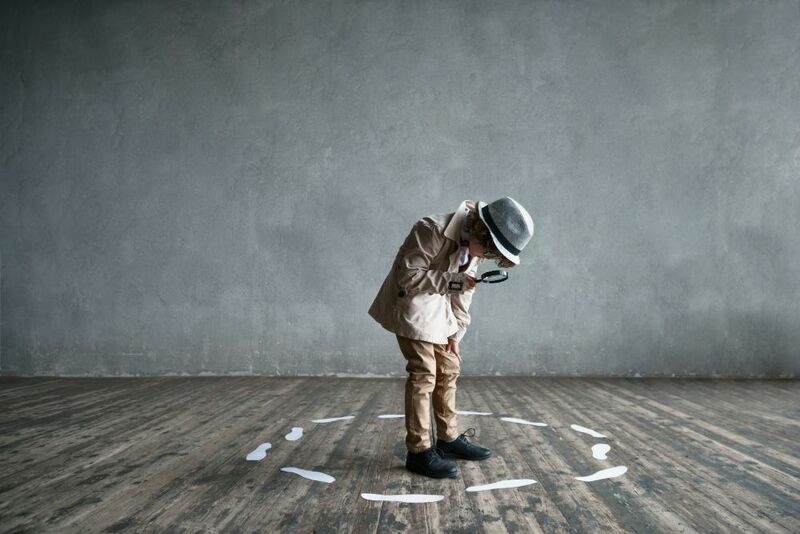 Giving children free roam to explore and play detective provides educational benefits and more. Our pick for the best spy toy for kids is the Kidwinz shockproof binoculars. These are high-quality binoculars with extra padding around the eye area for safe play. We hope that you liked our list, and be sure to share it before you go. Did you go on imaginary spy missions as a child? Tell us about it in the comments!